As a long time music fantatic I am not shy about admitting my love for reality singing shows. There are so many that it is hard to name them all, so I’ll focus on the main ones and the ones that i watch(ed). 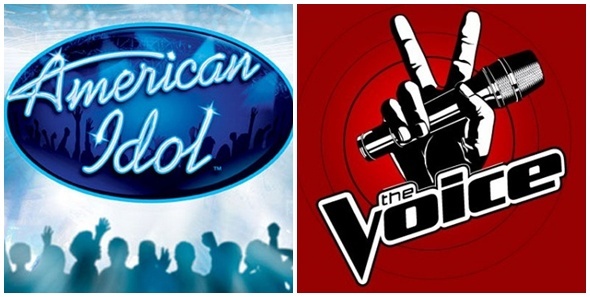 I think at the time American Idol and The Voice are by far the most popular, with The X Factor coming on strong as well. I have never been a fan of America’s Got Talent, and don’t consider that a true singing contest as their are other “talents” that are displayed. So, here are my thoughts on the main 3. American Idol is the “High School Upperclassman” of the group here. Idol has been around longer, and has established itself over the past decade. Though at times it seems watered down and saturated, the production has only gotten better since its inception. Remember the first season where it looked like they were singing in a high school auditorium? Man, have they come a long way. And good ol’ Seacrest, I hate to admit it, but Seacrest does one heck of a job on that show and by far blows away the “hosts” of the other two shows (i still don’t know the host of The X Factor’s name.. but more on that later). And speaking of hosts, is there any one person alive who has gotten more of a raw deal in life that Brian Dunkleman? Ryan Seacrest is on every TV show, radio station, and bar urinal cake and the only place I’ve seen Brian Dunkleman in the last decade is on an E! TV “Where Are They Now?” special. But, enough about that, lets move on to the contestants. There is something to be said for the Cinderella or the Underdog, and i think that is where AI thrives here. Their production and the way they bring into light the personal lives of contestants is second to none. The talent to me has dropped off over the past few years, yet they still make compelling television that is hard to turn off. I was pleasantly surprised with the debut season of the X Factor this past season. Contestants like Chris Rene, Astro, and … well, those are the only two I can remember… but they made for good drama. I liked the “team” format of the show, however I think that also was one of the downfalls of the show. Every week each coach took turns bashing the other teams’ contestants to the point where it almost made you believe that they were inferior participants. A little constructive criticism is healthy, but when you are repeatedly subjected to negative feedback and sophomoric bickering between the “role models” of the show, it has a less than positive effect. I feel this show allowed for some contestants to get by more on their audition than the actual competition songs themselves (see Chris Rene), but i do like the fact that they are allowed to play instruments and show their true talents. And as I stated before, the “host” of the show… this guy is awful and I still after watching the first season in full, couldn’t tell you the guys name for a million dollars. Though his purpose on the show isn’t of utter importance, it still gives you an appreciation for Seacrest and the job he has done on American Idol. That being said, every show has its growing pains, and i am excited to see the changes made for season 2. My personal opinion at this time is that The Voice is the most talented singing show on television. And i think the reason for that is the contestants and how seasoned they are. Last year’s winner Javier Colon and this year’s front runner Tony Lucca are extremely talented musicians, who have had years of touring and experience to help their case. These contestants already had a national following before being given access to millions of homes on a weekly basis. That being said, I think that may also serve as a setback for certain contestants on the show. Artists who already have a large fan base are off to a nice little head start before the show even begins. And the fact that The Voice promotes musicianship and not just singing really gives the show an edge. Artists playing an instrument gives them a certain appeal that solidifies them as a true musician, not just a karaoke all-star. The battle rounds are not my favorite, but I think they are a nice twist from the normal solo sing offs. The 4 judges/coaches also work well together and the banter between the 4 gives the show some spice. Carson Daly has done a adequate job as host, they use him just enough to make him stand out, but not be a drawback to the show. As with The X Factor I am extremely excited to see where the second season takes this show. And, being one of those pre-show fanbase fanatics of current contestant Tony Lucca, i have a completely biased, and vested interest. There you have it folks, my two pennies and some exhausted rambling. Please, by all means, chime in and tell me what you think. This entry was posted in life, music, Uncategorized and tagged american idol, javier colon, music, reality shows, singing competition, the voice, tony lucca, x factor. Bookmark the permalink. I agree with you completely about “X Factor”. I think that might be part of the reason Simon axed Paula, Nicole & Steve (the host). It has a few things that can be tweaked. I think that AI has gotten watered down, but I’ll probably always watch. The judges need to stop being so nice bc the music business isn’t always nice. Randy has become the voice of reason & honestly I’d listen to him (and Steven) over JLo. I like her, but we all know she has studio help. I love everything about “The Voice” except Christina. She’s very entitled. When’s the last time she had a hit? The last thing she did was “Burlesque”, which was a flop. She doesn’t measure up compared to the other judges. And she gets paid more than the other 3. I love CeeLo, but I really love the dynamic of Blake & Adam’s relationship. And I will always love me some Carson Daly.